I recently started playing Dice Masters with some family members. We started with the Teenage Mutant Ninja Turtles Dice Masters Set (which I previously reviewed). Today I’m reviewing the Yu-Gi-Oh! Dice Masters Starter for you today. Please understand that I’m reviewing Dice Masters as a relatively new player to the game. I’m giving you an overview of what’s inside, and my thoughts on this expansion. 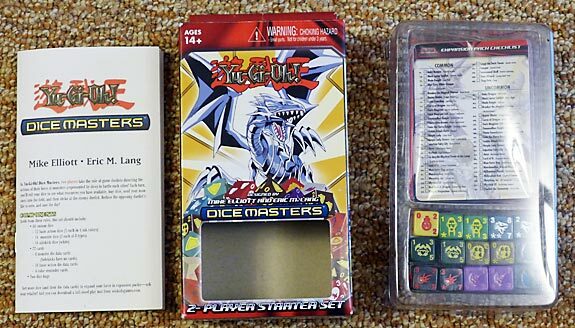 First thing I should say to any true Yu-Gi-Oh fan – this “Dice Masters” game is completely different from the “Dungeon Dice Monsters” game that is played in the Anime and was also a board game (shown on right) and a video game. That board game came out in 2002 and can still be found on eBay if that’s what you are looking for. 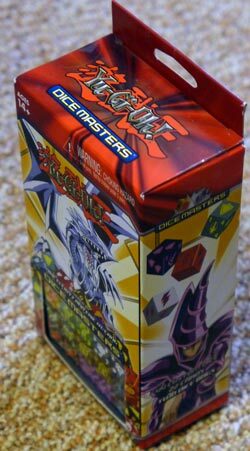 The YuGiOh Dice Masters Starter Set is relative small box – 3.5″ wide x 6.25″ tall x 2″ deep. The box is sealed. 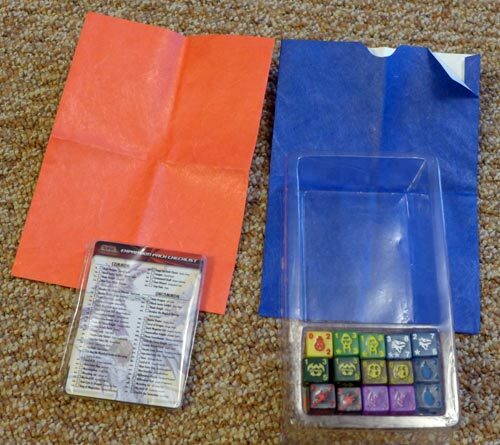 Upon opening the box, the cards and dice again sealed in a plastic tray. The first thing that caught my eye were the the dice bags. One of my bags had a poor glue job and was falling apart at the seems. The bags are just simple red & blue synthetic bags with no theme-ing on them whatsoever. That’s disappointing. You also get a small rule 24 page rulebook, written with a tiny font. Time to break out the reading glasses! If you are new to the game, I’d watch a YouTube video on how to play, and then read the rulebook to learn the finer points. The starter box is kind of laid out in a teasing fashion. You know there are 44 dice, but only 16 of them are Monster Dice. Then there are 12 Basic Action Dice and 16 Sidekick Dice. If you already own another starter, or own the TMNT Dice Masters set, the 12 Basic Action Dice and Sidekick Dice are totally redundant. I’m sure Wizkids has heard plenty of complaints from their dedicated players accumulating a crap-ton of of Sidekick Dice and Action Dice, because I believe they are getting away with this practice in newer sets. I know this box says it’s a 2 Player Starter Set. I’d probably call this a 2 Player Beginner Set, because you can only play a cheesy version of the real game if you break it up for 2 players. Why? Because in Tournament Rules, each player has 8 “die data cards”. This starter set comes with a total of 8 die data cards. So if two players are playing, each player only gets 4 die data cards. Beginners here will play with a total 10 Life Points in their beginner games. In tournament rules, you play with 20 Life Points. I would essentially call this a “YuGiOh Theme Deck” and I think that’s how you should look at it. 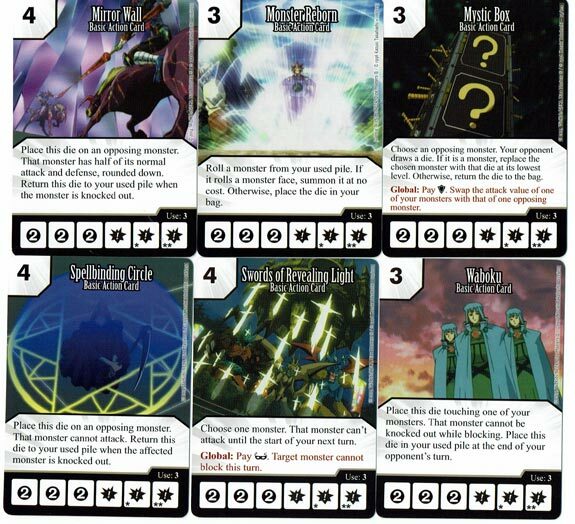 One nice thing about Dice Masters is that you can pick up other “2 Player Starter Decks” and consider them theme decks, and then pair them off against each other. 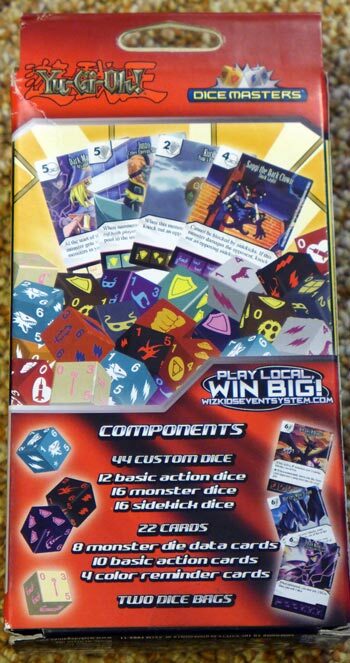 One cool thing about Dice Master is that you can have YuGiOh characters fighting the Teenage Mutant Ninja Turtles, or Spider-man, or other characters from Marvel, or Batman and other characters from DC … and even against characters from Dungeons and Dragons. You can even merge sets altogether and have Spider-man fight alongside your Blue Eyes White Dragon. In our family we have been keeping these “theme decks” together and simply dueling against the other theme decks. Anyways, let me show you the cards you get inside. I tossed these on my scanner so you could take a look at the cards, and their special powers. 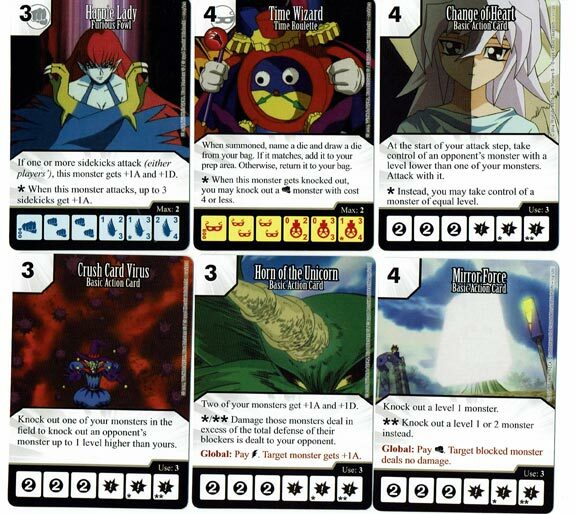 In Summary, you get a total of 8 monster cards, and 2 monster dice to go with each monster. 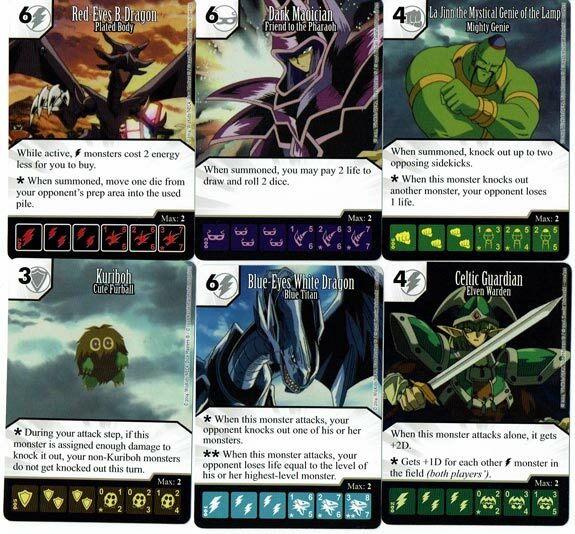 Then there are also 10 Basic Action cards you can use when building your deck. I was disappointed that you only get a total of 8 monster cards in this box, but at least these Basic Action Cards look pretty good! One weird note is that these YuGiOh dice have serial numbers on them. There’s some weird rule where your serial numbers have to match the cards. We just ignore this as we’re just playing casually. I don’t know how picky they are with this in tournament play, but if you’re into tournaments, you probably already know the answer. All in all, as a newbie player, there are some fun cards here. If you are into YuGiOh, I’d consider picking one of these up. Bear in mind, I’d also pick up another starter that interests you so you can have two full teams playing against each other. There are plenty of other starters to pick from, as well as two Teenage Mutant Ninja Turtle Complete 2 Player sets with two full 8 character teams inside each box. If you get into the YGO theming of Dice Masters. 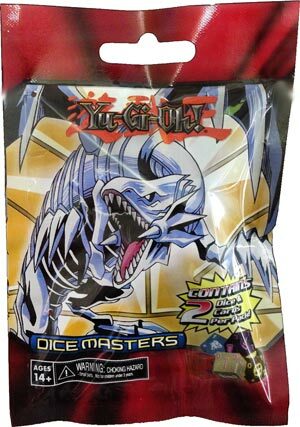 You can enhance your collection with YuGiOh Dice Masters Booster Packs. Booster packs contain 2 cards and 2 dice. The dice match the cards inside, making each immediately usable for play. Each Booster costs 99 cents. There are a total of 110 YGO monsters with matching dice in the set. And there are commons, uncommons, rares, and super rares to collect. 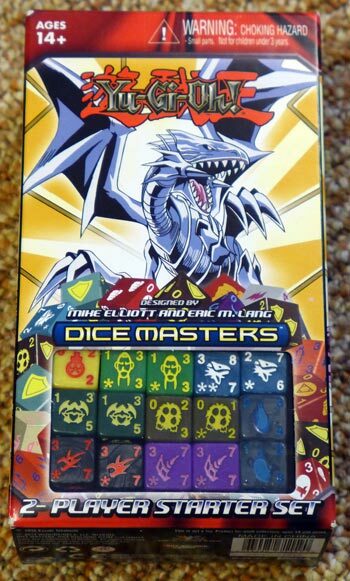 There is also a YuGiOh Dice Masters Playmat that I highly recommend. Playmats makes Dice Masters much more enjoyable and more sensical. There are a variety of themed playmats for Dice Masters. They are made of Mousepad-type material and roll up and travel well.